This manual is for pyExifToolGUI (version 0.32, January 2013). 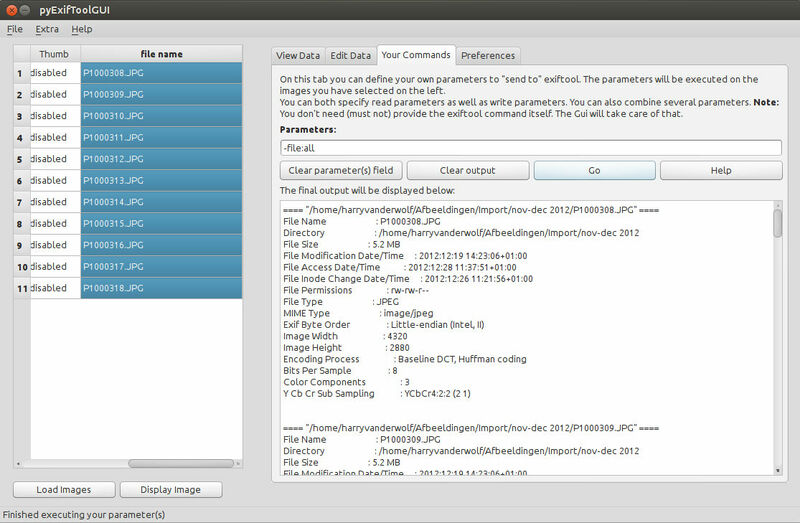 pyExifToolGui is a python pySide QT4 script program that reads and writes metadata like exif, xmp, gps, gpano tags from/to image files. It can use a "reference" image as source image to copy data from. A strong point of this software is the ability to write the data, copied or not from a source image, to multiple images at once. 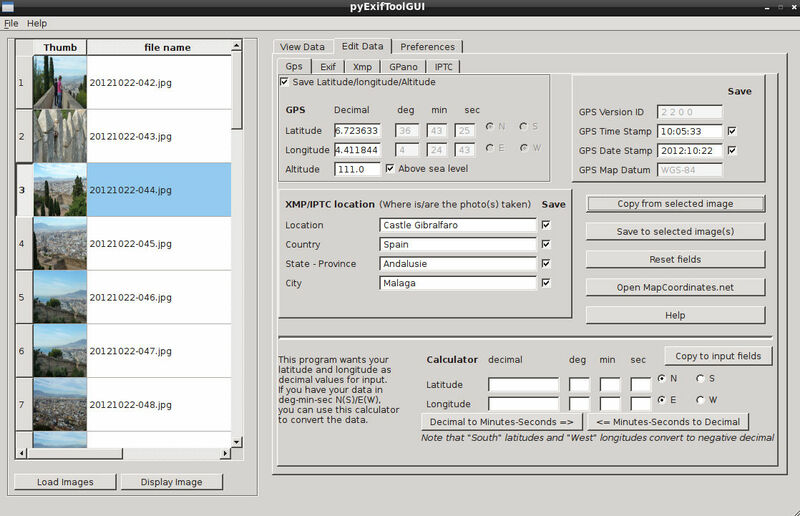 pyExifToolGui is a python pySide QT4 script program that reads and writes exif, gps, xmp, gpano (and a very limited set of IPTC) tags from/to image files using exiftool. pyExifToolGUI: py for python, GUI for Graphical User Interface to ExifTool. pyExifToolGui is a graphical frontend for the excellent open source command line tool ExifTool by Phil Harvey. pyExifToolGui is not a complete ExifTool Gui, far from that. 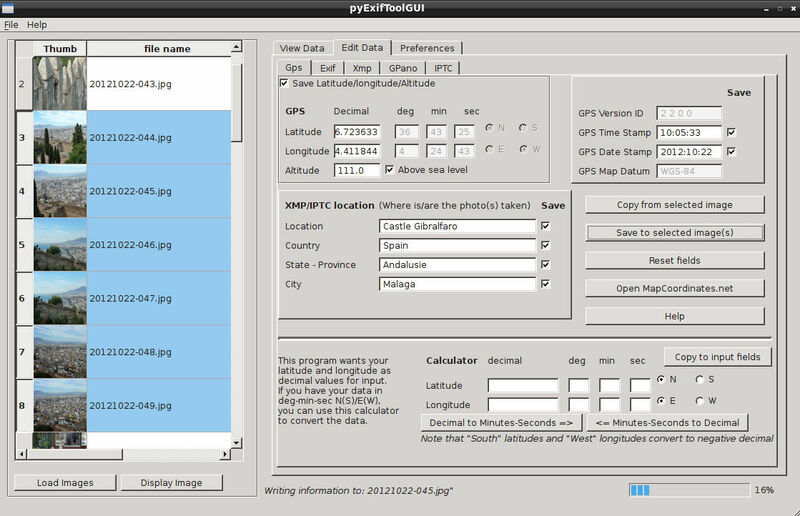 I needed a tool to add gps data to my images and couldn't find one and decided to write my own. So the main goal for this tool was the ability to write gps data to photos as I photograph a lot in buildings like Churches/Cathedrals and Musea (when allowed), which means that the gps functionality of the camera doesn't function. In the mean time the functionality of pyExifToolGUI has expanded and also supports reading, writing and exporting all kind of metadata. 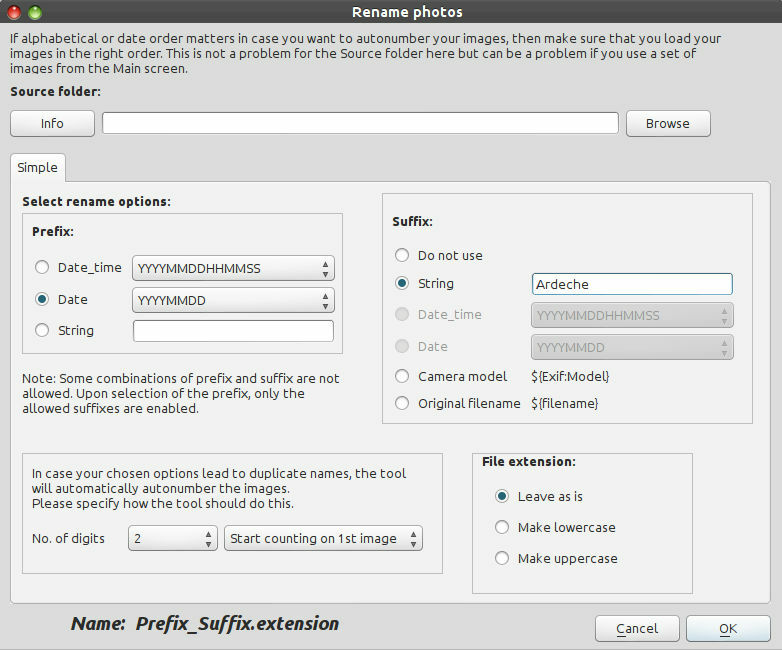 Next to that it now contains also extended photo file renaming functionality based on the exif info in your photos. By now pyExifToolGUI is a general exiftool Gui but it is still far from complete. This pyExifToolGUI tool is also a geotagging tool since version 0.4! IPTC tags are only partly supported. IPTC is an older and slowly deminishing metadata standard being replaced by xmp. Where applicable, e.g. redundant tags in xmp, the iptc tags will be updated simultaneously. This program is Open Source and completely free and will always stay that way, but you can donate any amount to me to show your appreciation. See the Help menu in the program or the donate button below. This manual and the pyExifToolGUI version might not always run synchronously. If new functionality is added to the program which requires a new chapter or paragraph, the manual will be updated for that new section. However, not all parts of the manual will/might be updated which might lead to older program screens in the manual that might slightly deviate from the program version you will be working with. Note also that you will see screen captures from several operating systems (Linux/Windows/Mac OS X) and/or window managers (on Linux). This tool is written for Linux and primarily aimed at Linux. However, it runs fine and functions fine on Mac OS X and Windows as well for which, respectively, a program bundle and an executable is available for download. pyExifToolGUI is currently not part of any Linux distribution and I'm currently lacking the skills to write a distutils or exportutils (or good automake/configure) script to package it for Ubuntu (or any other Debian based linux), or (Open)Suse or Fedora/Redhat. This also means that it doesn't do any dependency checks for necessary libraries and so on. I wrote a simple "setup" script that takes care of installation and removal. This setup script is for Linux but can also be used on Mac OS X. Note: pyExifToolGUI comes without exiftool which you need to download yourself from Phil Harvey's exiftool site if you want the latest version. On Linux you can also use the version belonging to your distribution. For Mac OS X you can either run the simple pyExifToolGUI.app bundle (via the setup script) from the tar.gz and install the dependencies yourself, or you can download the full bundle which includes everything internally. For Windows a python executable has been created (Note to Windows users: Currently there is the closed sourced but free exiftoolgui for windows. 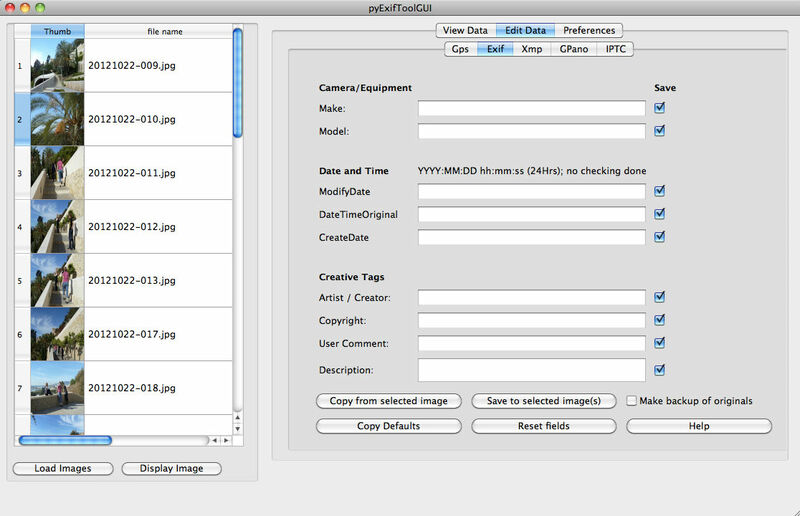 pyexiftoolgui contains the functionality of applying your changes to a selected set of images at once, exiftoolgui only has this on a limited set of tags. The total "functionality set" of exiftoolgui is currently more then that of pyexiftoolgui, but it misses the new GPano functionality (see paragraph 5.4). You can run pyexiftoolgui without installing it: see paragraph 2.4 below the installation instructions. python: part of every linux system, so always available, but >=2.6 required. python-pyside (qtcore, qtgui and qtuitools are required): Install via your distribution's package manager. ExifTool: Install via your distribution's package manager. Untar the package to some folder. pyExifToolGUI will be installed and you should have an icon in your menu under the Graphics sub menu or in your Dash (Ubuntu). Download the dmg with the full pyexiftoolgui.app bundle. Open the dmg and copy the pyexiftoolgui.app to a place of your liking where /Applications is of course the most suitable location. python: part of every linux system, so always available, but 2.7 required. pyX.Y-pyside: Install via MacPorts. (XY needs to be 2.7). ExifTool: Download the DMG from the ExifTool website (highly preferred) or install via MacPorts. The script will install a "bare bones" pyExifToolGUI.app in your Applications folder. Note that the pyExifToolGUI.app is NOT a complete self contained application. It needs the mentioned dependencies. For windows an executable has been created. This could be easily packaged with some open source installer like INNOsetup, but for the moment it is simply packaged in a zip file. Unzip the zip archive to some folder of your liking and start it. This also means that the package does not create registry entries. Note: As mentioned in the intro: pyExifToolGUI comes without exiftool itself. If you download it, the default version for windows is called exiftool(-k).exe. Always rename this to exiftool.exe as the exiftool(-k).exe version pauses after every screen of output and requires a keypress to continue: You don't want that. (Tip: If you only see exiftool(-k) without an extension in you file manager then simply rename it to exiftool). You can run pyexiftoolgui without installing it. Make sure you have the dependecies installed as described above in the subsections. Make sure you have the dependecies installed as described above in the Windows subsection. Move into the folder where you untarred the pyExifToolGUI..tgz (You might need to download again if your removed everything). On Windows simply remove the folder containing the pyexiftoolgui.exe application. The program consists of a left pane containing your photos, and a right pane which consists of a set of tabs. One of these tabs contains a subset of tabs. Next to the tabs on the right the program also has an "Extra" menu which contains another set of functionalities. A number of buttons and functions will not work, and are disabled, untill you have loaded at least one photo. Most actions on your images which you perform in the right tabs or in the Extra menu, only work after having selected at least one, or more of the loaded photos in the left pane. Select an image and simply click one of the radiobuttons. If you have multiple images selected, the metadata for the last selected image will be displayed. Here as well: All actions in the right "Edit" tab only work after having selected one or more of the loaded photos. You can select one image and modify the data for it. You can select multiple images at once and modify the data for all these images at once. You can select one image, copy data from it, then select multiple images, and paste the (copied) data to these multiple images at once. This is not a tab, but a sub-menu from the main menu. A few options can only be used in conjunction with the Context menu. The program also contains "context menu" functionality, which is more generally known as "right-click" functionality. This functionality can be very handy in some situations as it reduces mouse (kilo)meters. Without photos loaded, you will have a "mini" menu. With photos loaded you will get a larger context menu containing image related functions. Context menu without photos loaded. Context menu with photos loaded. The "View Data" tab gives you the option to display all available meta data from a photo (image). You select a photo on the left side and click the radiobutton on the right side to see all or a selected set of data of the photo. 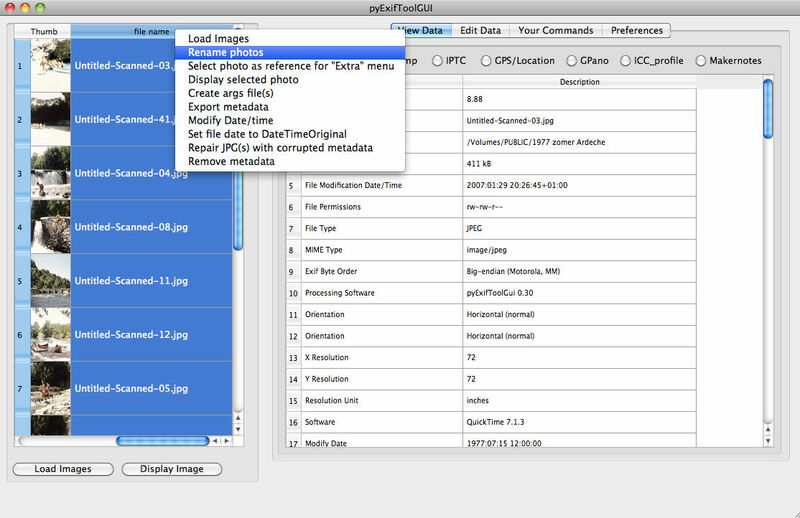 As ExifTool supports a large number of image formats, but also movie formats, all available metadata that ExifTool can read, can be displayed by pyExifToolGUI as well. The file filter, used to select files from the file dialog, is by default set to all image types pexiftool supports, but can also be set to the total set of file extensions that exiftool supports (and simply to "All files (*.*)"). Note that some of the data, or subsets of data, is simply not available in the non-image formats. pyExifToolGUI will try to make a preview (thumbnail) of the image, but will not always succeed as most RAW formats are not supported. In case of other formats like movies and so on, the creation of a preview will almost certain not function. Note that the "Display Image" button will display the selected image in the default image viewer. If this "image" happens to be a movie, the movie will be displayed in the default movie/media viewer if the format is supported. (Right-click ->Display image works as well). Image rotation is not always correctly "interpreted" by the underlying QT image plugins that create the preview thumbnails. If you think it is not correct you can simply select the image, click on the "Display Image" button and see whether your "normal" image viewer displays it correctly, meaning that your image has the correct setting. The application is a so called "tabbed" application. The "Edit Data" tab is the (obvious) tab that contains the sub tabs with all the edit options. Currently a moderate set of tabs have been defined but the order, number and even content can change during the further development of this application. This tab is used to add GPS data to your images. 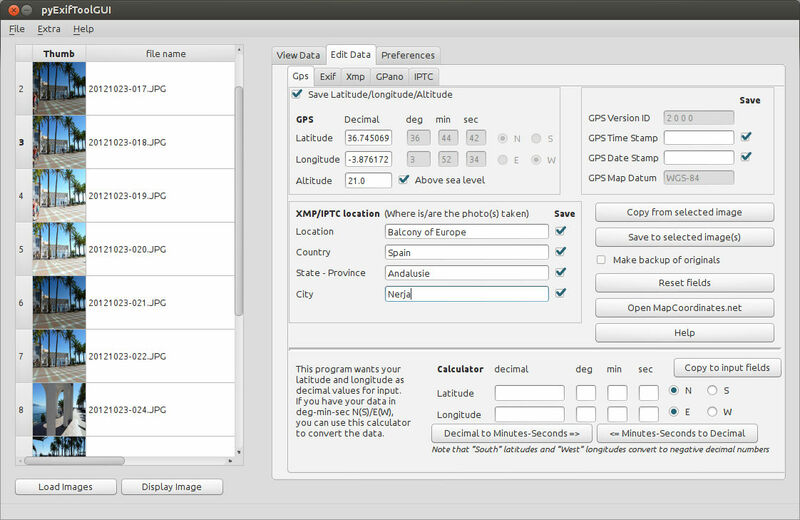 This tab works on a combination of exif, xmp and iptc gps data as latitude, longitude and altitude are covered in both the exif and in the xmp metadata structure. The Location metadata details (Country, Province/State, city, Location) are covered by xmp and IPTC. This tab therefore acts on multiple tag categories (exif, xmp and iptc) at once and simply tries to make your gps/location data as complete as possible in the several tag categories. 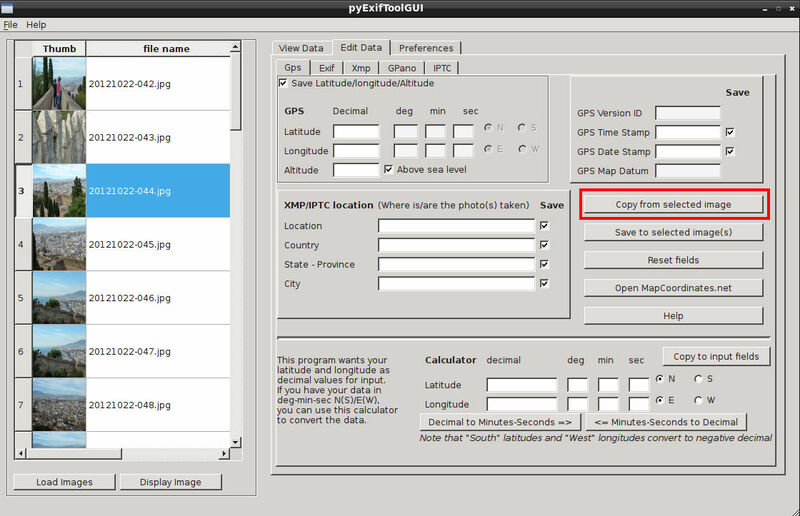 Copy from selected image: This will copy all the (available) gps data from the selected image into the input fields. Save to selected image(s): This will save the gps data to your selected image(s). Note: When the "Save" checkbox is enabled, empty fields will write empty values to your image(s). Take this into account! Reset fields: This will empty all fields and set radiobuttons and checkboxes to their defaults. Open MapCoordinates.net: This will open the mapcoordinates.net website enabling you to get and copy latitude, longitude and altitude data for your photo(s). MapCoordinates is based on Google Maps. Note that the altitude is mostly correct. but sometimes completely wrong. Help: This button opens the manual you are currently reading. Copy to input fields: This copies the calculated values (bottom half) to the input fields (top half). Decimal to Minutes-Seconds: Convert decimal longitude/latitude values to deg-min-sec. Minutes-Seconds to Decimal: Convert deg-min-sec to decimal latitude/longitude (necessary for input). This tab is used to add (a limited amount of) exif data to your selected image(s). Things to take into account! overwrite existing data with empty data "by accident". deliberately overwrite existing data with data from empty fields. 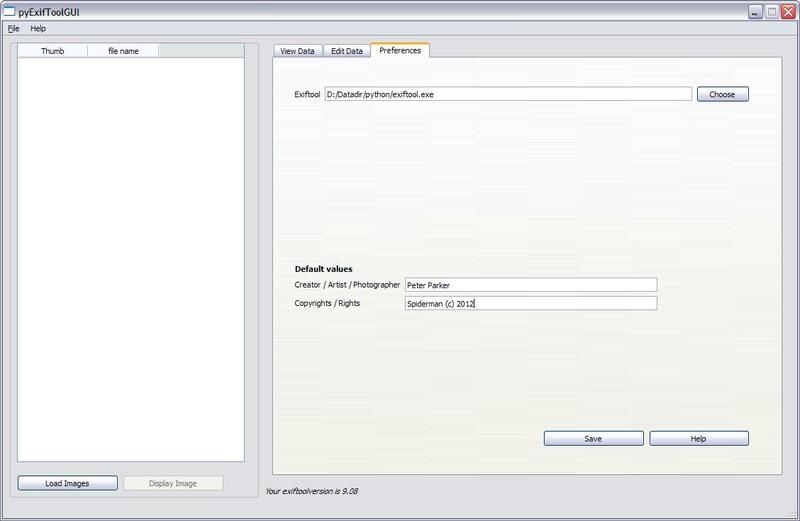 Copy from selected image: This will copy all the (available) exif data from the selected image into the input fields. Save to selected image(s): This will save the \"checked\" exif data to your selected image(s). Copy Defaults: This will copy the default Artitst and Copyright data which you provided in the Preferences tab. Reset fields: This will empty all fields and set checkboxes to their defaults. This tab is used to add (a limited amount of) xmp data to your selected image(s). Copy from selected image: This will copy all the (available) xmp data from the selected image into the input fields. Copy Defaults: This will copy the default creator and rights data which you provided in the Preferences tab. 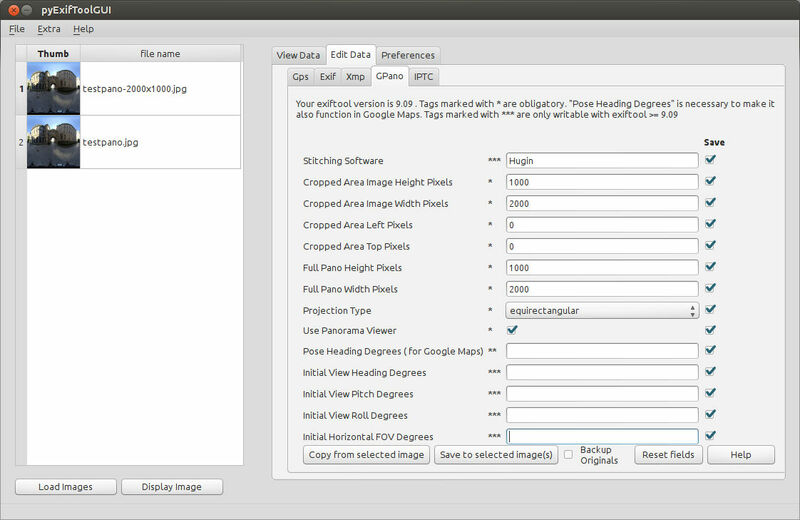 This tab is used to add GPano Google PhotoSphere data to your selected image(s). This functionality is only available if you have exiftool 9.07 or newer. You can always download the latest exiftool version. On Windows and Mac OS X simply install it. On Linux you simply unpack the tar.gz to some folder. After the install/unpack you can use the Preferences tab to select that untarred version. Geotagging adds GPS data to your images based on data from a GPS track log file. This GPS track file can be used from your phone, gps device, navigation device, or whatever you have providing such a GPS track. The GPS track log file is loaded, and linear interpolation is used to determine the GPS position at the time of the image, then the following tags are written to the image (if the corresponding information is available). It means that your camera needs to be set correctly with regard to the date/time of the location where you are. 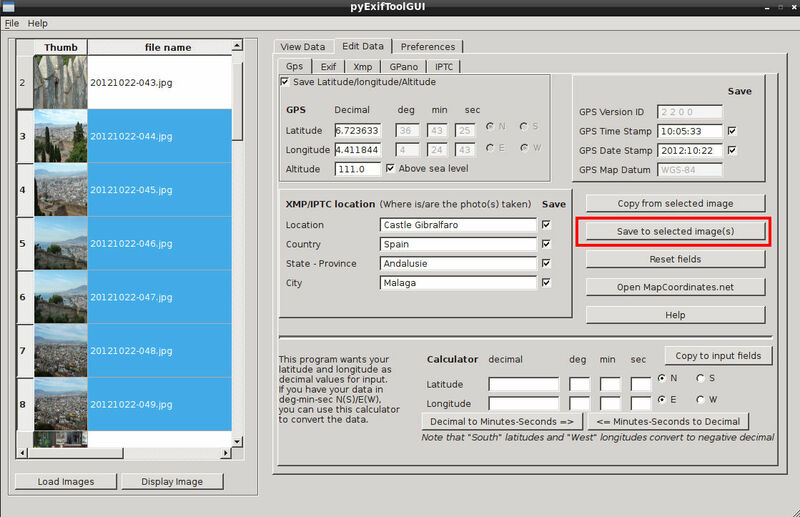 PyExifToolGUI also supports the "Geosync" feature of ExifTool. The Geosync tag is only needed when the image timestamps are not properly synchronized with GPS time. For example, a value of "+1:20" specifies that 1 minute and 20 seconds is added to the Geotime value before checking with the GPS track file. This is for a camera running 1 minute 20 seconds slower than the GPS clock. The Geosync time is specified as "SS", "MM:SS", "HH:MM:SS" or "DD HH:MM:SS" (where SS=seconds, MM=minutes, HH=hours and DD=days), and a leading "+" or "-" may be added for positive or negative differences. Use (a selection of) the images you loaded in the left images pane. Specify a folder containing a set of images to be tagged. In case of the first option you need to leave the folder empty. If the "Folder containing the images:" is not left empty, it will always be the first option used. 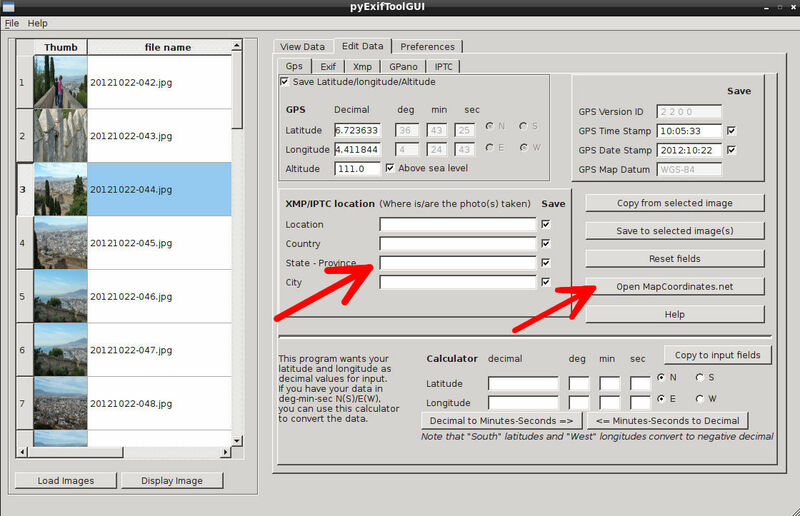 Note that pyExifToolGui will write both the EXIF GPS tags as well as the XMP GPS tags. IPTC is an older metadata information standard. It stands for "International Press Telecommunications Council", also with a combination with the Newspaper Association of America (NAA) Information Interchange Model (IIM). This already shows the primary goal of this standard which is perhaps not what an amateur photograph is aiming for. Next to that: IPTC is being phased out in favor of XMP. On some of the edit tabs the IPTC data is automatically updated when (for example) the xmp data is updated. 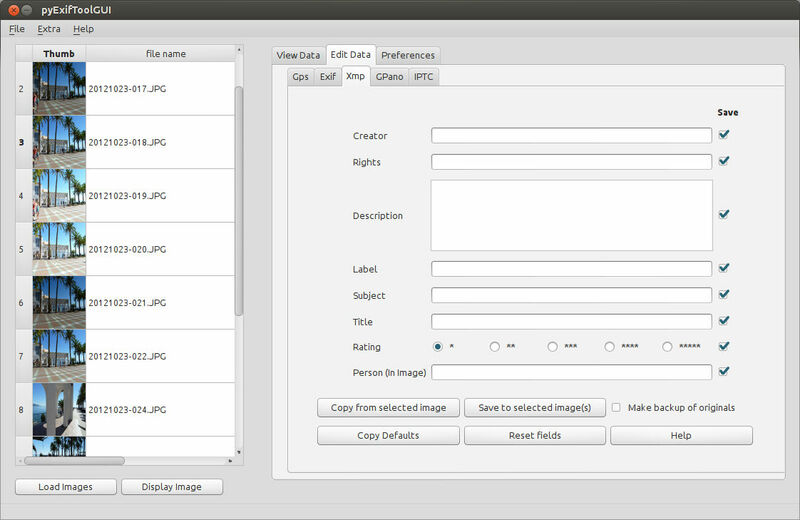 Below you'll find an example of how you can use the program to edit the metadata of your images. Click the images for a full size version. Load your image(s) via "File -> Load Images", via the "Load Images" button or via the right-click option in the context menu. Go to the "Edit -> Gps" tag. If one of your images contains the info you need for your other image(s), select that image. Use the "Copy from selected image". The available gps information will be copied into the relevant input fields. The xmp/iptc location info (location, country, state, city) is hardly ever available, but you can add the info yourself. In case your images don't contain any information at all, but you do know the location, you can click the "Open MapCoordinates.net" button. This will open the mapcoordinates.net website in your default webbrowser. mapcoordinates.net is based on google maps and you can search for the location and landmarks, like "Eiffel tower" (in Paris) or "machu picchu" (Peru). The website will display a popup with the decimal altitude and longitude coordinates and the altitude. Note that this altitude is mostly correct, but sometimes completely wrong. After you have added or altered the information, you need to pay attention to which information you want to save to your image(s). The Save checkboxes determine which information will be stored upon saving. Note that when an input field is empty, you can by accident, or deliberately write "clean" the data in your images for the relevant tags. Now select the photos on the left side where you want the information to be saved into. Note that Shift and Control works in selecting the photos. Once you have selected the images click the "Save to selected images" button. Once the button "Save to selected images" has been clicked you will see a message displayed describing which image is processed and a progress bar displaying the complete progress. We set the file date based on the datetime metatags we have just set in the previous set. We rename the photos based on metadata tags and possible string (like the occasion, location or whatever you want to use to identify/classify the photos). The following workflow consists of a mix-and-match of Mac OS X screens and Ubuntu Unity screens (the latter with Mac OS X windowing icon theme as I don't like Ubuntu Unity's default orange icons). After you have loaded your image(s) and made your selection, you select the "Modify Date/time" option by either right-clicking and selecting it from the context menu or from the Extra menu. The "Modify Date/time" dialog will be opened. Note: If you have a photo with the correct datetime tags, you can select it from your photo-selection, right-click that photo and select the option "Select photo as reference for "Extra" menu". You can then use the copied data in a number of edit screens. It will remain available after a new "load image(s)" session. Set the date and time in the "ModifyDate" field to the correct date (In this case of old scanned photos as accurate as possible). Optionally copy&paste the "ModifyDate" field value to the other two fields. These data fields are Exif datetime tags. If you want the XMP datetime tags also be set, check that XMP checkbox as well. When done click the "Save" button. If you did select a reference photo with correct datetime metadata tags, you can now use that data by checking the "Use date and time from reference image". It will immediately fill/update the three datetime fields. Right-click somewhere in your selection and select from the context-menu the option "Set file date to DateTimeOriginal" or select that option from the "Extra" menu. If you scanned your old photos, negatives or diapositives, your scanned images will get the file date time of the moment of scanning while your images itself are (most certainly) much older. This function will now take the "exif:DateTimeOriginal" from the metadata datetime tags in your image(s) you just added in the previous step and use that as file date/time. 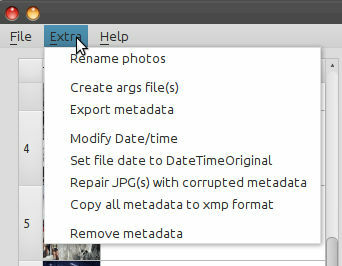 Note: exiftool can go back as far as 01-01-1970 for file dates (metadata can be any date/time). If your images are from e.g. 26 December 1958 (mid day) you need to use the "touch" function on linux/Mac OS X like "touch -t 195812261200.00 name_of_image(s)"
Renaming your photos requires that your photos must contain metadata as that is where exiftool renaming is based upon. Right-click somewhere in your image selection and select the option "Rename photos" from the context menu or select that option from the "Extra" menu. The "Rename photos" dialog will be opened. The extra menu gives a set of exiftool command options which will be explained in the following subsections. The functionality of this screen is also partially described in the 5.6.2 After scanning: Correcting Date/time and Renaming workflow above. Using a (sub)selection from the main screen. Selecting a source folder in this renaming screen. The way of working is described in the last subsection of 5.6.2. = Selecting a source folder in this renaming screen. When you use this option the renaming will work on all supported formats in the selected folder and in any subfolder of the selected folder. = What are the differences? The main screen selection gives you the option to load a set of images from a folder and work sequentially on the subselections. It is therefore more flexible. The source folder option on the other hand is up to 10 times faster. Exiftool has the option to output information in the form of exiftool arguments. 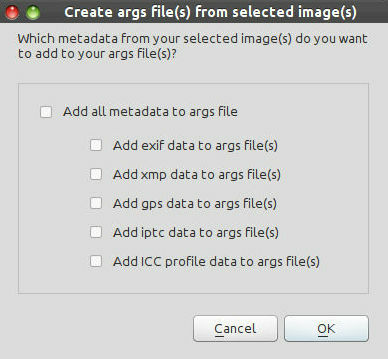 If you create an args file by exporting the information from your photo(s), you can use this args file as an "exiftool commands" file to write to another (set of) photo(s). pyExifToolGUI (currently) only supports the creation of these args files. pyExifToolGUI can't use these files (yet) to write to other photos. A workaround however is to use this args file from the "Your commands" tab as explained in chapter 7 Your commands. 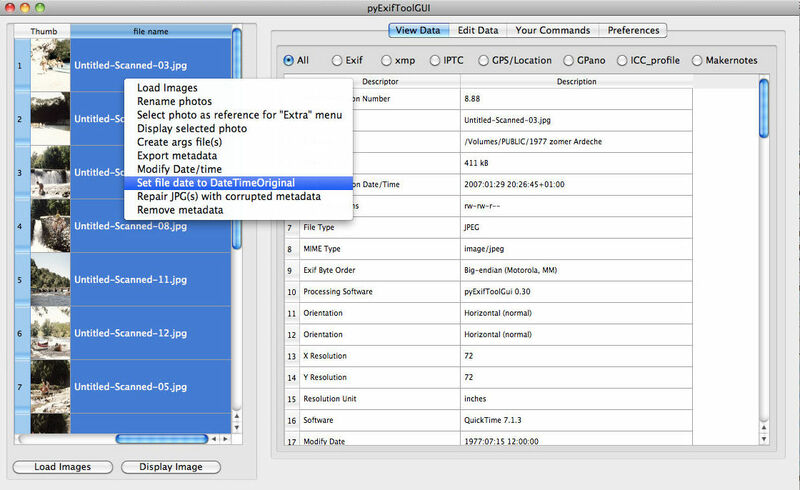 Exiftool can export the metadata inside images to a number of output formats. 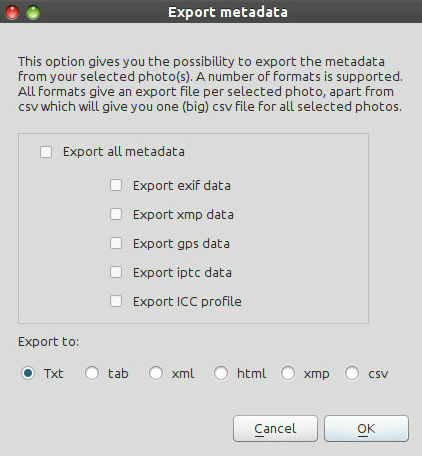 From this popup screen you can export the metadata from your selected image(s) to files in these export formats. Note that per selected image an output (export) file is written (1 photo gives 1 export file). The only exception to this is the "csv" format. The "csv" format is an LibreOffice/OpenOffice/Excel compatible format which contains one row of metadata per image in one "output.csv"file. Note also that the output files are written to the same folder as where the images are. 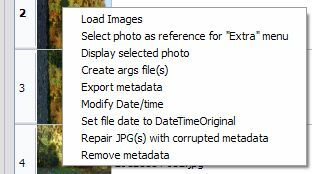 As the popup mentions: This dialog gives you the option to modify the several date/time tags in the exif information like in the "Edit->Exif" tab. It works on the images you selected in the main screen. 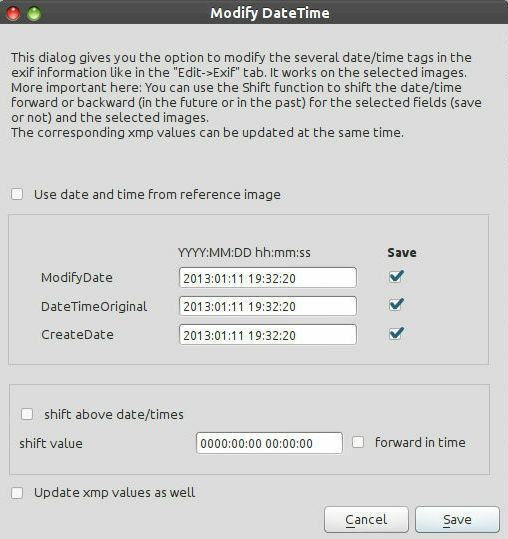 This dialog gives you more date/time functionality (and only date/time functionality) compared to the exif->edit tab: You can use the "shift above date/times" function to shift the date/time forward or backward (in the future or in the past) for the selected fields. This function also respects whether you selected the specific tag (field) to save or not, and also works on the selected images from the main screen. 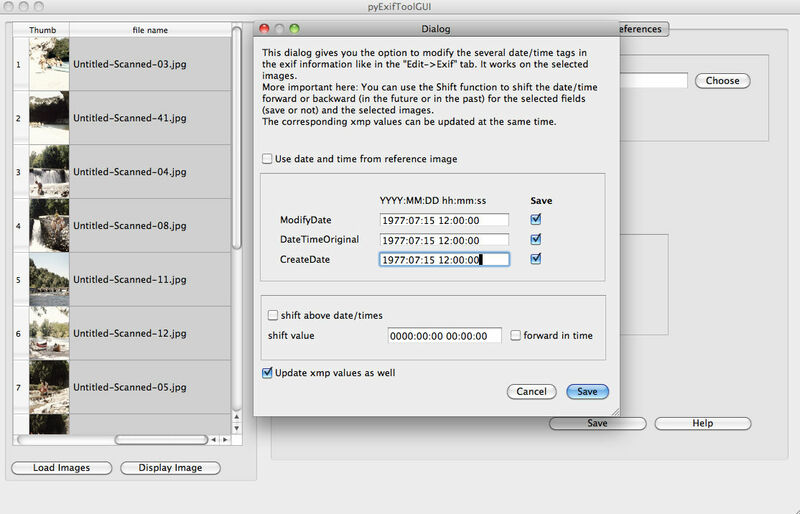 The "Use date and time from reference image" can also be used in combination with the "shift above date/times" function. The corresponding xmp values can be updated at the same time. If you modified your images in a "sloppy" image editor or copied them around or whatever other action(s), the file date/time of your images might have changed to the date when you did your action/modification on the photo(s). In such a situation the real filedate(= creation date) of your images is (much) older. You might want to change the file date back to what it really should be based on the metadata when you took the photo. Another option could be that you scanned some old photos, negatives or dia positives. These photos will get the date when they were saved after the scanning. Next to that: these scanned images mostly contain no exif data at all. This "Set file/date time to DateTimeOriginal" function will take the original date/time when the photo was taken from the exif:DateTimeOriginal and use that (again) as file date/time. As the popup on the left already mentions: If exiftool can't write to your photo it might be due to corrupted metadata. Exiftool can fix a lot of the metadata but only for the tags that are still readible. In a jpeg the image data is separated from the meta data. 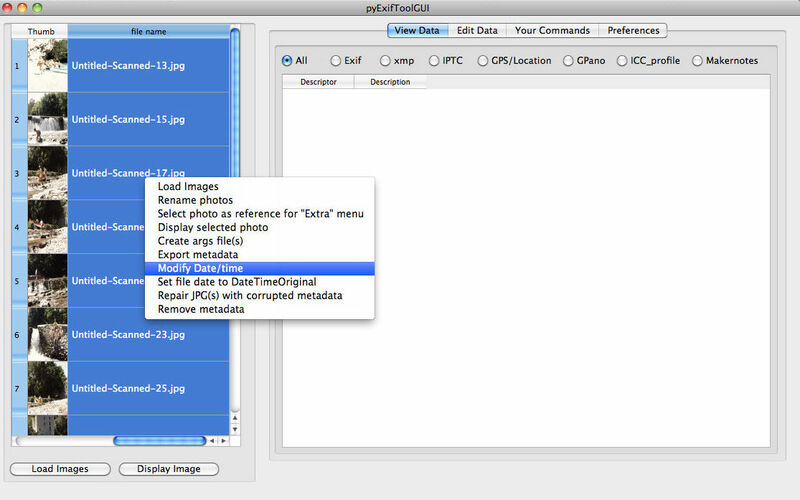 Exiftool will create a clean metadata structure and write as much metadata back to the metadata part of the JPG. Note: If your photo can't be displayed in an image viewer, your image data itself is corrupt. Exiftool can't repair that. This only works for jpgs as a lot of other formats don't separate the metadata from the image data. XMP stands for "Extensible Metadata Platform", an XML/RDF-based metadata format which is being pushed by Adobe. Information in this format can be embedded in many different image file types including JPG, JP2, TIFF, GIF, EPS, PDF, PSD, IND, INX, PNG, DJVU, SVG, PGF, MIFF, XCF, CRW, DNG and a variety of proprietary TIFF-based RAW images, as well as in MOV, AVI, ASF, WMV, FLV, SWF and MP4 videos, but also in WMA and audio formats supporting ID3v2 information. XMP is a "growing" and easy extensible metadata format and already incorporates a lot of EXIF and IPTC metadata. It also allows for software products to define their own set of XMP tags, like the Google photosphere, microsoft face recognition and Digikam xmp tags. 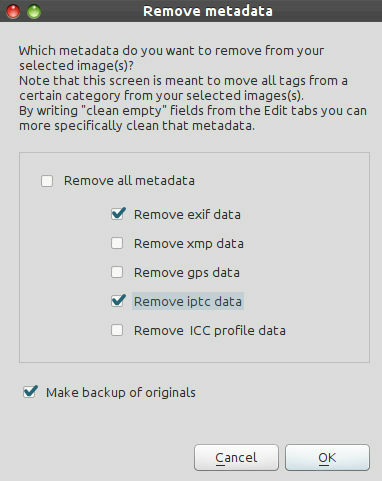 This "Copy all metadata to xmp format" function copies all the relevant information from the exif and iptc tags into the corresponding xmp tags. This function (on the left) is the most dangerous one of the program. Therefore it is one of the few functions using a second "Are you sure?" popup (see below) and that's also why it makes a backup of your images by default. For the rest it is simple: It removes the metadata you select. On this tab you can define your own parameters to "send to" exiftool. The parameters will be executed on the images you have selected on the left. You can both specify read parameters as well as write parameters but not in one command: write actions take precedence. You can also combine several parameters. Note: You don't need (must not) provide the exiftool command itself. The Gui will take care of that. See also the exiftool Application Documentation which gives extensive information and lots of examples. The Preferences tab gives you the option to select some defaults for this application. Windows: You always have to specify where exiftool.exe is. Please rename exiftool(-k).exe to exiftool.exe. If you stick to exiftool(-k).exe the program will pause after every screen of output and wait for a key to continue. That will give problems in pyExifToolGUI (in any GUI for that matter). Linux and Mac OS X: The program will check for an installed exiftool in the standard program folders. If not found you have to specify where exiftool is. You can also use this option to specify a newer exiftool version then standard available for your distribution. At this moment most Linux distributions ship with some 8.xy exiftool version. For the Gpano functionality you really need a version equal or newer then 9.07. See also "5.4 Edit GPano (Google Photosphere) data". These fields give you the option to specify your name (for example) and some copyright notice (for example: Spiderman (c) 2012). They can be copied into the relevant exif, xmp and iptc fields for these values. Copyright © 2000, 2001, 2002 Free Software Foundation, Inc.